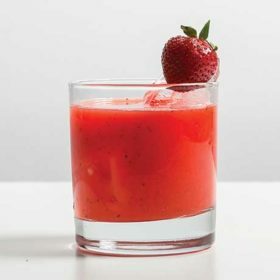 There isn't one right drink for last call, so we found five recipes highlighting different traditional spirits for first-rate nightcap cocktails. A nightcap, or the last drink of an evening, comes in many enticing forms. Is it a calming digestif to conclude a meal? Is it a strong, stirred bed-timer meant to induce restful sleep? Or is it a lower-alcohol option, to prolong conversation and gently close the evening? The truth is, there’s more than one way to nightcap. It’s less about defining the drink itself, and more about its timing and context. For many, a nightcap is a straight pour to warm and comfort, like a dram of your favorite whiskey, brandy, amaro or fortified wine. With this in mind, we offer five paths, using a traditional sipper as the building block for an ideal last-call cocktail. Start with the base you enjoy most, and you just might end up with a new favorite closer. Warming caramel, vanilla and spice make whiskey a popular end-of-night tipple. Bourbon is often a nightcap staple, as is Scotch. The Don Lockwood uses a bit of each to create a pleasing, sweet-smoky effect reminiscent of that last bite of a s’more just as the campfire embers billow out. Don’t fret if you haven’t got both Bourbon and Scotch on hand—just double up on one, as the drink works with any whiskey. Splitting the base between the two just adds nuance. In rocks glass, combine all ingredients except garnish. Add large ice cube and stir. Garnish with orange peel. Brandy comes from a wide range of provenances and is available at an array of prices. Select one that you enjoy sipping straight to create mixed drinks just as wonderful. Try a V.S.O.P. (Very Special/Superior Old Pale) Cognac: It’s delicious, but not too old or rare to mix. Another solid option is an Armagnac, made in the Armagnac region of Gascony. It’s a favorite before-bed nip (with a square of dark chocolate) of several industry pros. 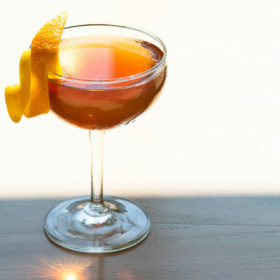 After you find your brandy Goldilocks, mix it with amaro for a low-maintenance nightcap. Nope, we didn’t skip a step in this recipe. This is a scaffa, a room-temperature­ cocktail made without ice. There’s some debate as to what the word means. Was it the creator’s family name? Does it refer to an old Italian word for “cupboard,” as in, to use whatever ingredients are available within it? Either way, the spirits have no chill or dilution to hide behind. So, in this case, reach for top-shelf options. “Simply build in the glass, retire to bed, sip and ease yourself into slumber,” says Momose. Combine ingredients in rocks glass with no ice. Garnish with peel, if desired. Whether as a primary ingredient for lower-alcohol sippers or a supporting player alongside more spirituous ingredients, both fortified­ and nonfortified wines are worth having on hand. Amontillado Sherry is delicious enough to sip straight or mix into cocktails­, like this riff on a Bamboo (a 50-50 mix of sweet vermouth and Sherry). Here, banana liqueur adds a subtle tropical feel. In mixing glass, stir together first three ingredients with ice. Strain into coupe or Nick and Nora glass. Garnish with orange peel. Whether your favorite liqueur is fruity, creamy or nutty, they’re often served in cordial glasses or small wine glasses to accompany or act as dessert. But they can also add sweetness and flavor to cocktails. Instead of coffee after dinner, try this luscious coffee-and-cream riff on the classic Brandy Alexander. In cocktail shaker, combine all ingredients except garnish with ice. Shake well, and strain into coupe glass. Garnish with nutmeg.